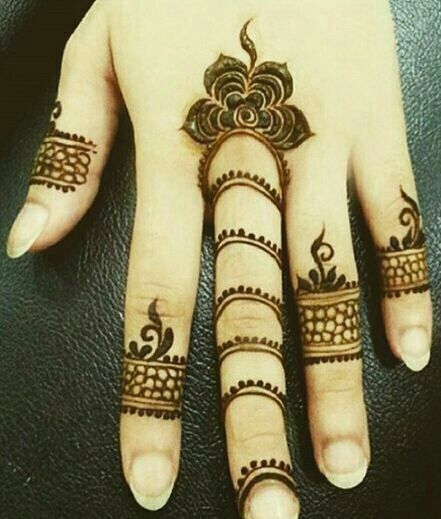 Iam loving simple and minimalistic mehndi designs these days because they are easy to do and dont require much time too. 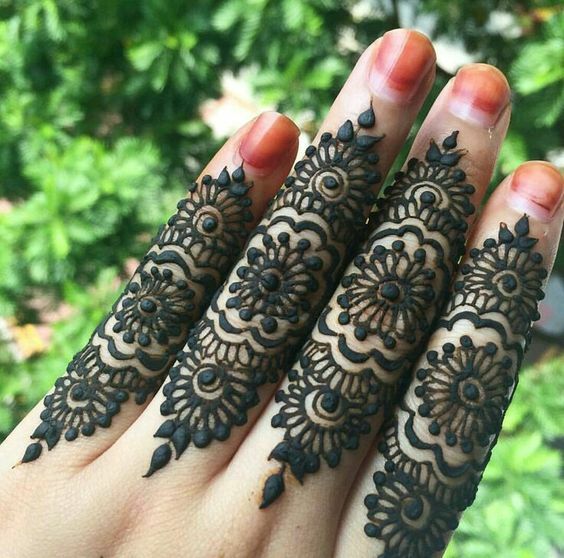 For simple occasions like eid or a cousin's wedding you can keep thing classy and elegant by going for fingers only henna mehndi designs. These designs mean your hands have a lot of empty spaces making it look very modern. 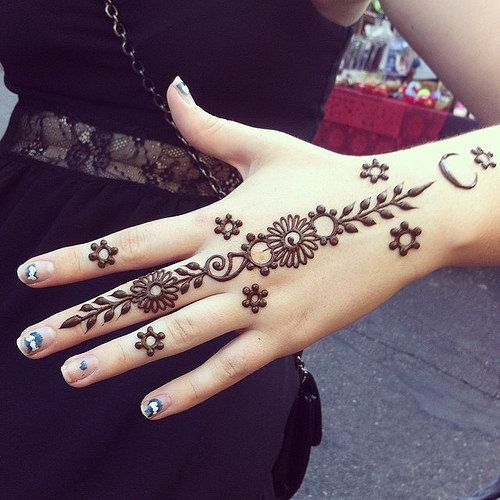 If you are wearing something indo-western then these kind of mehndi designs are perfect. 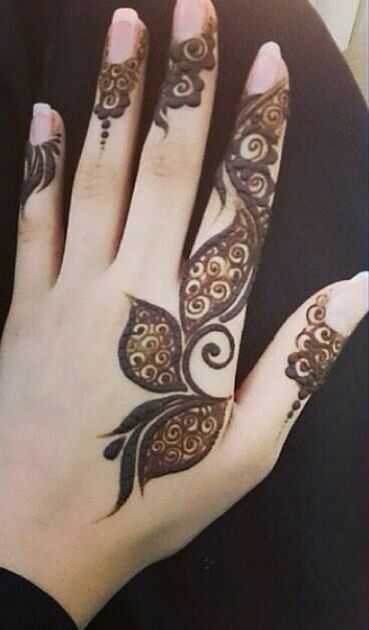 Personally I prefer a single kali mehndi design for front of hands and for back I do fingers only mehndi design. My sparkling rings look amazing with finger mehndi designs on back of hand . 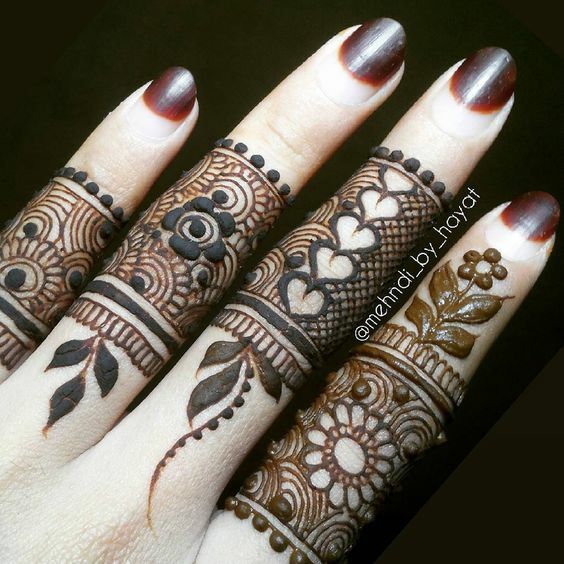 If you have a hevay pattern on front of hands I suggest you balance things out by going for finger mehndi design for back of your hands. 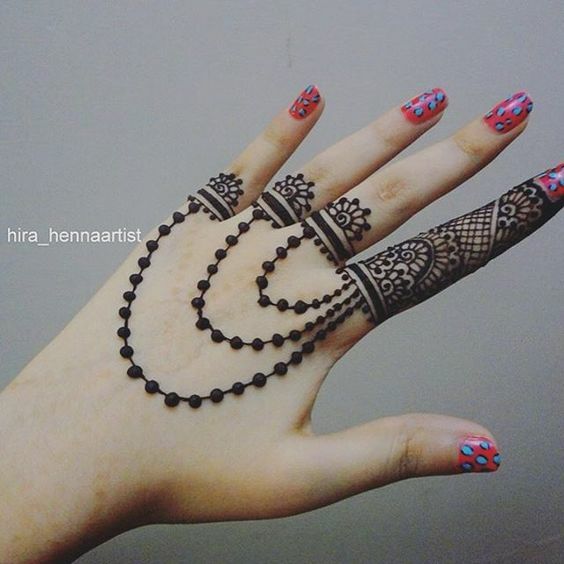 Here I bring to you some really gorgeous henna mehndi designs for your fingers to wave in style . 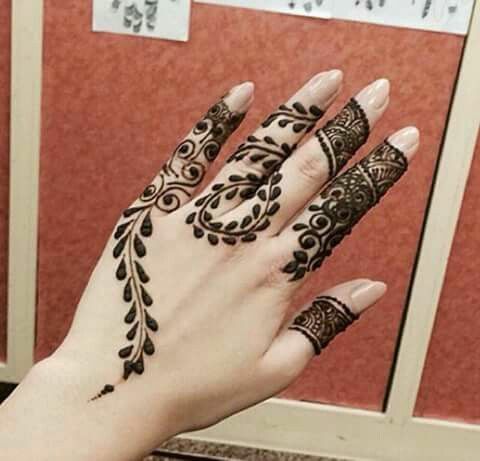 If you dont like mehndi designs much and want to try a simple design this jaali design with leaves at the base is perfect. 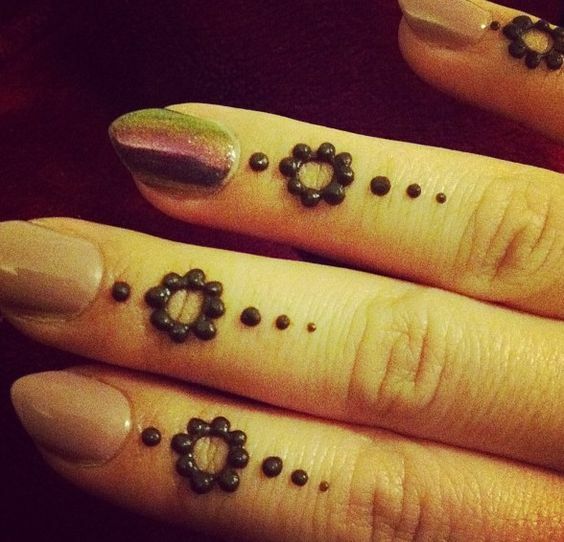 This is easy to do with a mehandi cone having a tiny hole in the tip for fine lines. 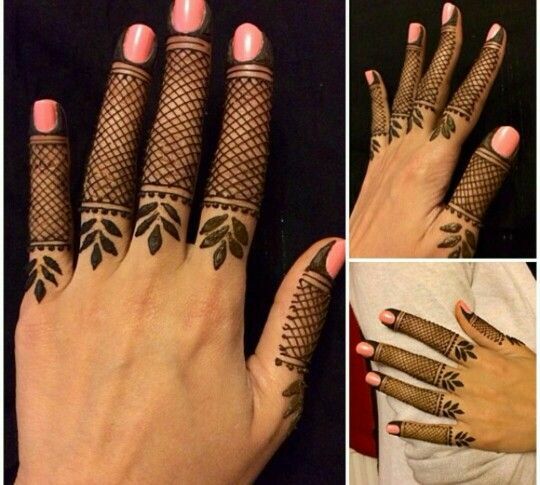 This netted henna design looks very contemporary and works with both Indian and western outfits beautifully. 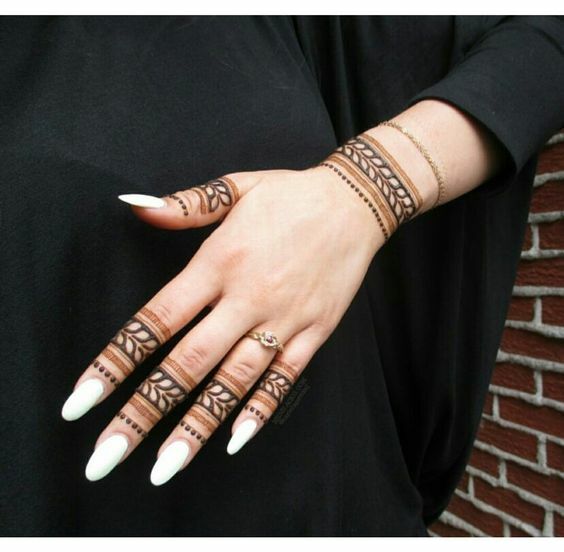 Want some mehndi on your hands and short of time? Try this super easy dotted flower for fingers which looks effortless, simple and contemporary. 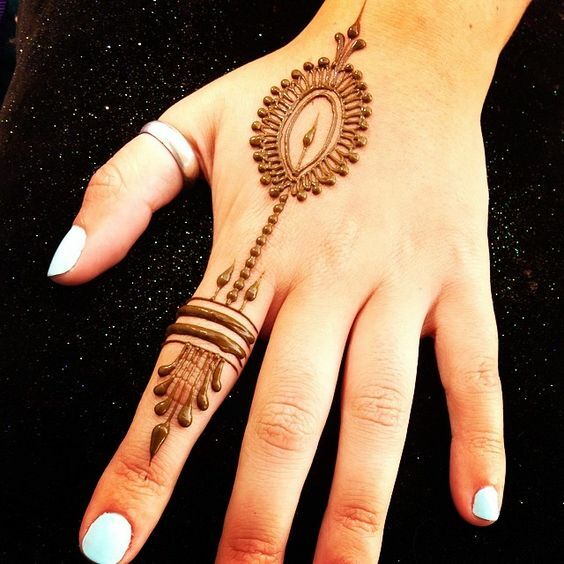 This finger mehndi design is ideal for beginners and if you have a heavy pattern on the front of your hands it makes a lot of sense to go easy on the back of your hands. 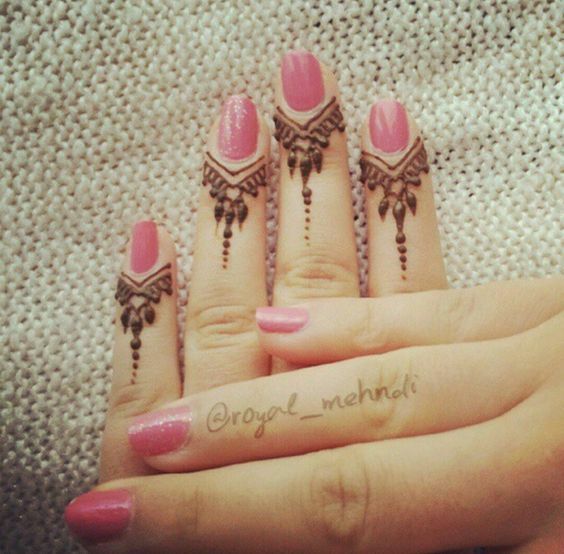 How delicate and WOW is this rose mehndi design for fingers? 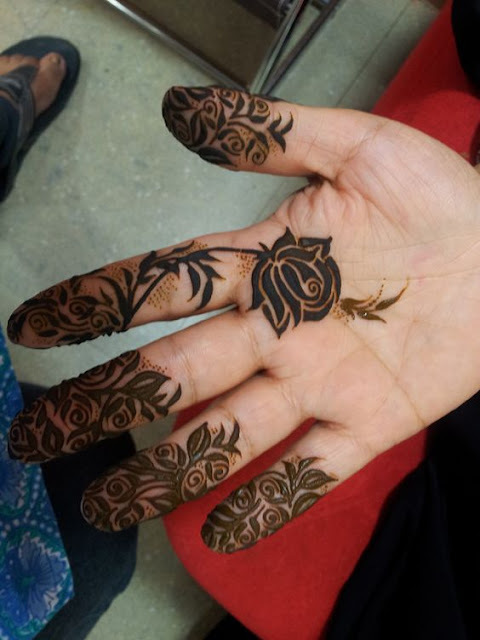 if you are looking for something elegant and fresh try this finger rose mehndi pattern which extends a wee bit to your palm with a gorgeous rose. since this is a very delicate pattern you require steady hand and a cone with thin hole. 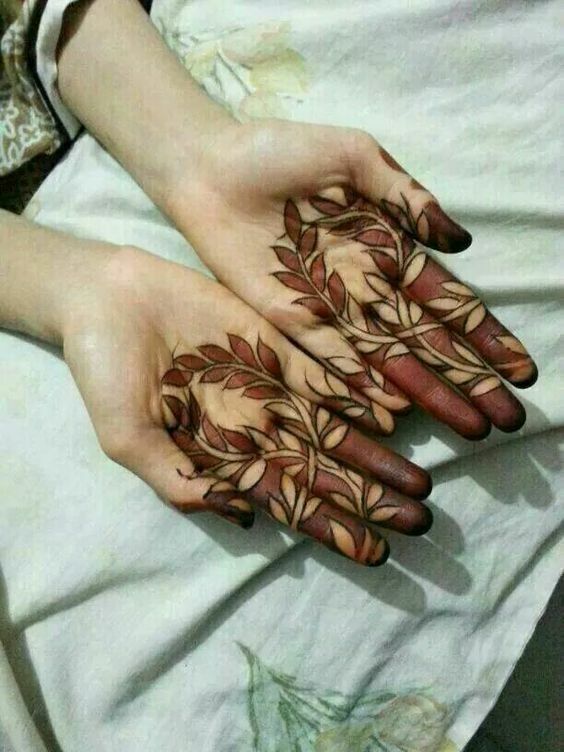 For back of hands I always prefer simpler designs and this leaf mehndi pattern is very interesting single line henna design. I love how the jaal on finger is so unique and leaf design on finger tips is beautiful too. 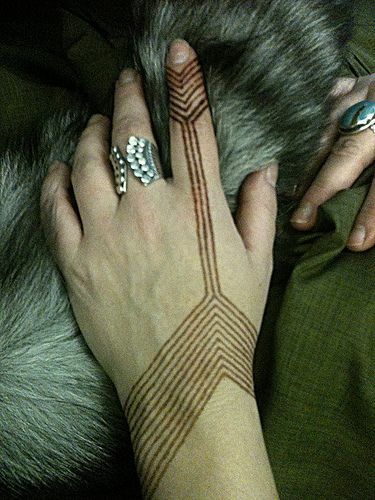 If you dont want anything traditional go for this Moroccan inspired geometric henna design. This design looks best with western outfit or traditional outfits which have a contemporary cut or drape. 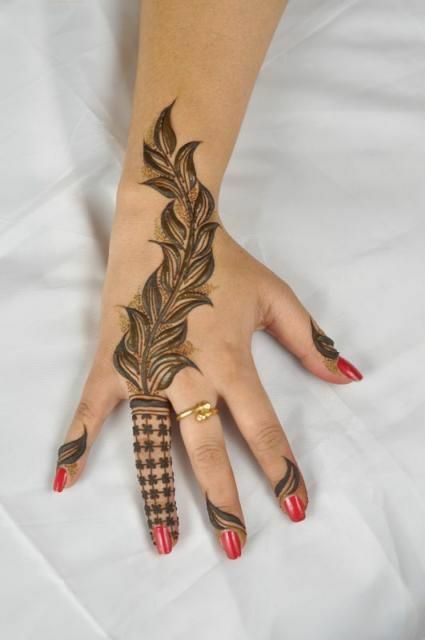 If you want just a single finger mehndi design try this pattern which is quick and easy to do. 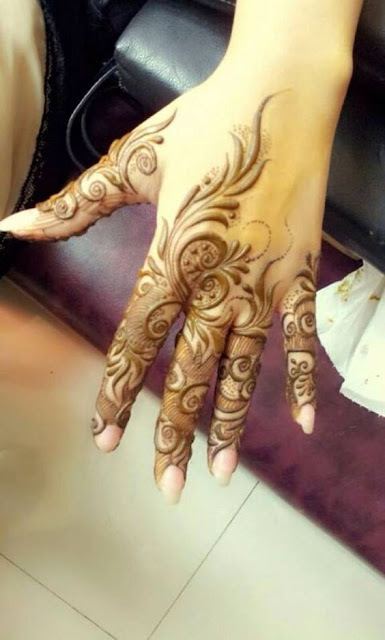 Go for a good quality cone which will really affect the colour of your mehndi. Another thing quality cones do is they extend the longevity of your mehndi designs. The normal singh mehndi cones hardly last even for a week which annoying peeling of layers. 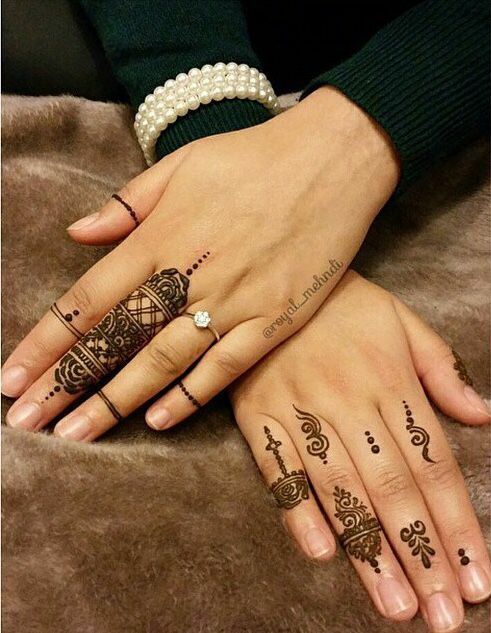 Allow your mehndi to sit on your hands overnight for a perfect dark colour. 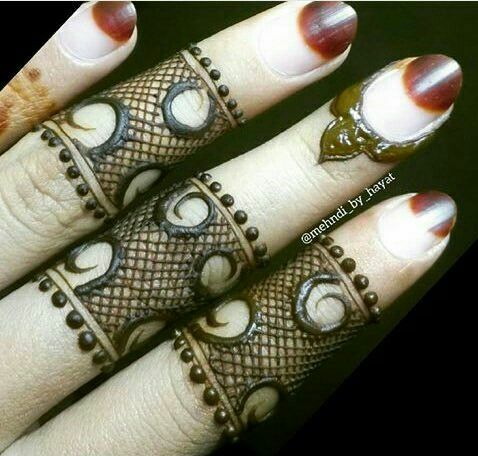 Dont use water to wash off your mehndi. 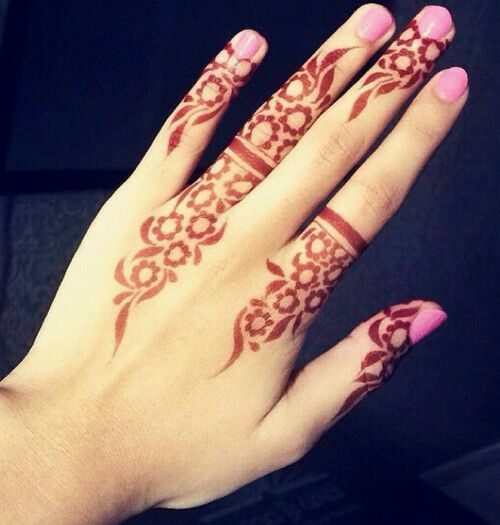 Use a blunt knife to scrape of the dry henna . If mehndi is too rigid then appli some baby oil or coconut oil and scrap it off. 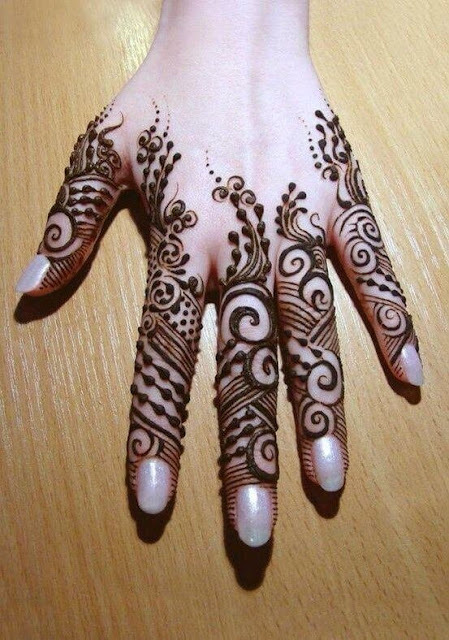 If you love the colour of henna on hands then go for thicker patterned mehndi design instead of delicate thin designs. Going for a design with a mix of both thick and thin lines is also a good idea. If you like bling add some glitter and stones to to your mehndi design after it has been scrapped off. you get tiny rhinestone type bindis in bangle shops which look great with mehndi designs.. 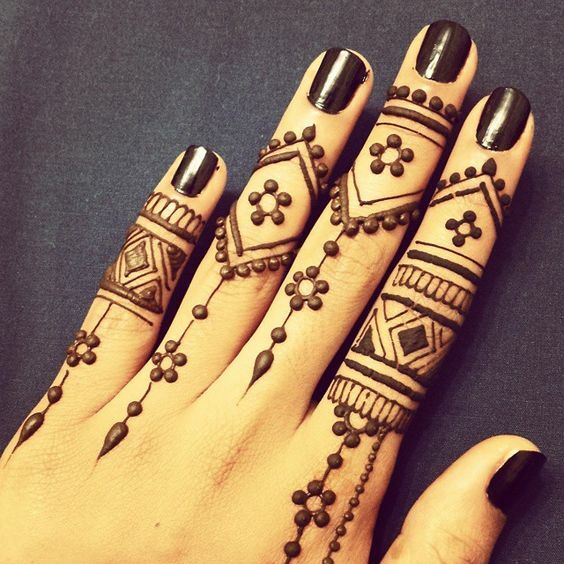 So, are you ready to adorn your fingers with some gorgeous finger mehndi designs? Which design is your favourite? 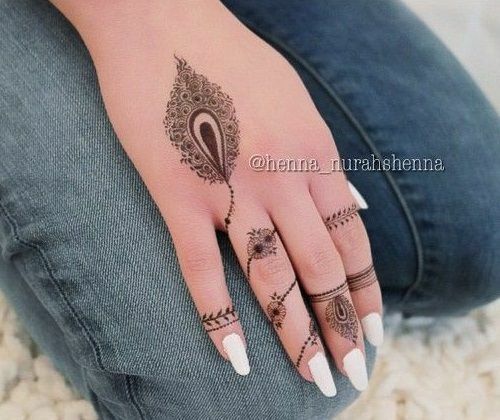 15 best arabic mehndi designs to flaunt this wedding season!